Sometimes, it's better to keep things simple. For the perfect dinner roast, try our simple, yet tasty, two-ingredient whole roasted chicken. Remove giblets from bird and discard. Wash bird inside and out under cold water and pat dry with paper towel. Place bird in a disposable tinfoil tray. Season the backside with seasoned salt. Flip the bird (breast side up) and sprinkle with seasoned salt. Place in oven and cook 70—80 minutes until thermometer reads 165 degrees and the juices run clear. 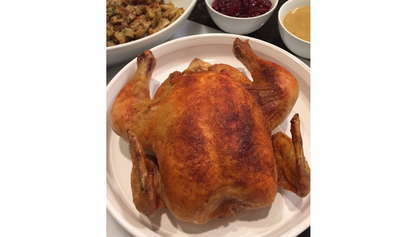 Remove bird from oven and using a pastry bush, baste the bird with juices from bottom of the pan. Allow to rest.